"Misty the retired sled dog from Alaska playing with Rikki the Siberian Husky." 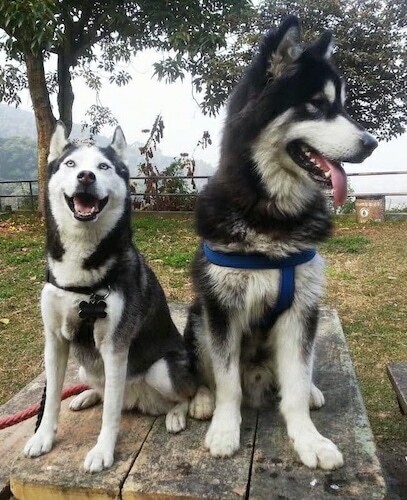 Shane the female Siberian Husky at 6 years old on the left and Marco the male Alaskan Malamute at 18 months old on the right—"Both dogs are from a rescue center. I have two more husky-mix breeds as well. Both are very active, but can only have frequent short walks during Hong Kong's very hot summers. They love the country parks in winter! Although Marco has a dominant personality with some other dogs, he's very friendly with people. Shane is shyer with strangers, loves to play tug-of-war with the leash, and starts very noisy play-fights with Marco even though he is twice her weight (25 vs. 42 kg). Marco was completely untrained when he arrived at 1 year old. It took 3 to 4 months to civilize him, and it has been well worth the effort. I very quickly learned that he responds well to praise, and poorly to scolding; that was the key to him making progress." "Dream is 3 years old in this photo. She is mostly black (Siberian Husky). When we bought her they told us she is a particular type of Siberian Husky, a ’Sport Husky,’ ideal for hard work, like a sled dog. Her behavior is similar to Laska, but she is less independent and more affectionate to us. She could be an Alaskan Husky..."
"Laska at 10 years old is a black-and-white Siberian Husky. She still acts young, she plays, sometimes she tries to bark (she prefers howling), and she is the leader of our dogs’ pack." 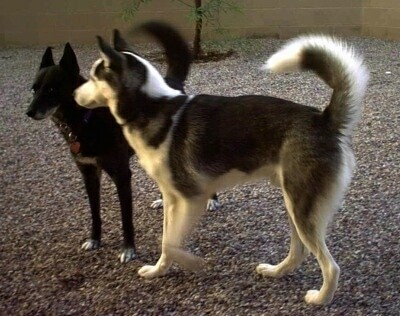 "Winnie is a little black-and-white Alaskan Malamute, possibly mixed with Husky and the youngest element of the group. Her eyes are unique...one brown and one light blue with a brown spot...fantastic. She's a bit naughty, she loves water, swimming and ’biting’ water." "Winnie the black-and-white Malamute at 4 years old (shown above as a puppy) is very strong, adorable and smart. She loves water, taking a bath, and loves the snow. She's a good guard dog and is the only one of my dogs who will defend our home." 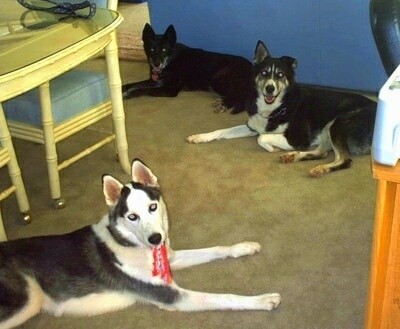 "Daisy, a grey Siberian Husky, and Dream, my 6-year-old black-and-white Alaskan Husky. are very fast, tireless and a bit wild. They love hunting cats, rats, birds and any small animals they can find!" 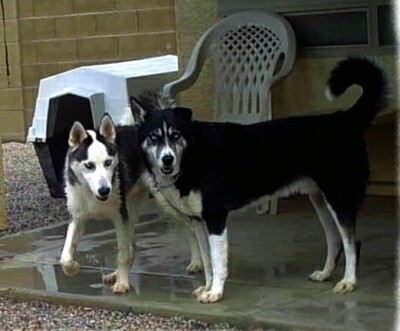 Rikki (left), a Siberian Husky shown here at 8 1/2 months old with Moose (right), a Malamute / Husky mix (Alusky) at 5 years old. 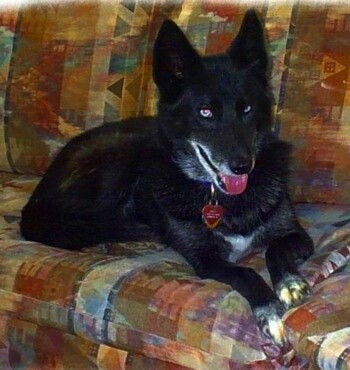 "Misty is our retired sled dog from Alaska; shown here at 7 years old."